The White House statement on International Holocaust Remembrance Day did not mention Jews or anti-Semitism. As Holocaust historian Professor Deborah Lipstadt put it, "what we saw from the White House was classic softcore denial. The Holocaust was de-Judaized." In Elie Wiesel's classic memoir of Holocaust remembrance, Night -- which depicts the horrors of the Auschwitz concentration camp -- the Nobel Peace Prize laureate and Holocaust survivor wrote that "to forget would not only be dangerous but offensive; to forget the dead would be akin to killing them a second time." "No word can contain the solitude, the solitude of the Jewish victim who was more alone and more abandoned and more tragic than all the other victims. Granted, there were other victims as well; we should never forget them either. But the solitude of the Jewish victims remains unparalleled. How many times must we repeat that? Everyone who was not Jewish had family outside. Thus, the non-Jewish prisoner could cling to hope: 'If I die, my son will live. My parents will have more children. My sister will remarry.' The Jewish prisoner knew that he or she was alone, maybe the last, for his or her entire family had been condemned to extinction. An entire people was sentenced to death for being." Indeed, 1.3 million people were deported to Auschwitz -- 1.1 million of them were Jews -- of which Elie Wiesel was one. One million of them were murdered, including Elie's parents and sister. But let there be no mistake about it: as Elie would remind us, Jews were murdered at Auschwitz because of anti-Semitism, but anti-Semitism itself did not die at Auschwitz. As we have learned only too tragically, and all too well, while it begins with Jews it does not end with Jews. Jew-hatred remains the canary in the mineshaft of global evil that threatens us all. Elie's voice and message were missed when the White House statement on International Holocaust Remembrance Day did not mention Jews or anti-Semitism. And while this omission may have first appeared to be one of inadvertent error, Trump spokesperson Hope Hicks acknowledged -- indeed affirmed -- that the wording was intentional "as we are an incredibly inclusive group and we took into account all of those who suffered," with "inclusivity" becoming a gateway for "alternative facts" and revisionist history. As Holocaust historian Professor Deborah Lipstadt put it, "what we saw from the White House was classic softcore denial. The Holocaust was de-Judaized." Clearly, the U.S., like any other country, has the legal authority to regulate admission to its borders and the responsibility to protect its national security. 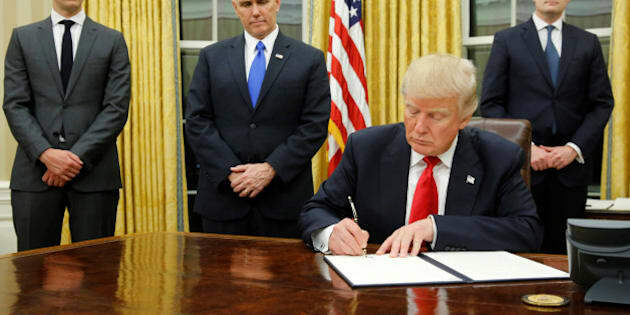 As the executive order put it, the U.S. seeks to "protect its citizens from foreign nationals who intend to commit terrorist attacks in the United States." But the Trump executive order has turned fact and law on its head. First, between 1975 and 2015, foreign nationals from the seven banned Muslim-majority countries killed exactly zero Americans on U.S. soil. Second, there is no evidence whatsoever that there are any terrorists among the small number of Syrian refugees admitted to the U.S. Third, the attempt to halt refugee admissions -- where refugees are persons determined to have a well-founded fear of persecution were they to be returned to their country of origin -- falsely presupposes the incidence of terrorism among refugees themselves. Finally, in a cruel irony, Yazidi lawmaker Vian Dakhil -- who became famous for her 2014 speech to Iraq's parliament as her people faced genocide -- will not be allowed as an Iraqi citizen to attend the ceremony next week in Washington to receive the Human Rights Lantos Prize, named for Holocaust survivor and former congressman Tom Lantos. As Katrina Lantos-Swett, the president of the Lantos Foundation put it, "it's hard to imagine a more ironic and powerful illustrative example of how wrongheaded this executive order has been conceived." And this is but one of many absurd and abusive examples. Moreover, the perceived xenophobic -- if not Islamophobic -- character of the executive order may achieve the exact opposite of what it purportedly intends to do, i.e. it may serve as a recruitment tool for Islamic State rather than as a protection against international terrorism. Indeed, we also miss not only the particularity of Elie Wiesel's voice in the matter of Holocaust remembrance, but the universality of his message in the face of these executive orders. As he put it in his 1985 Nobel Prize lecture on the imperative of standing up against injustice: "Wherever men or women are persecuted because of their race, religion or political views that place must -- at that moment -- become the centre of the universe." And he added: "There may be times when we are powerless to prevent injustice, but there must never be a time where we fail to protest against injustice."